UroLife™ is a new medium optimized for the culture of Human Bladder Epithelial Cells from the Apex (also known as the Neck or Trigone) region and the Dome region of the urinary bladder. UroLife™ supports the growth of these cells over a period of at least 15 population doublings. UroLife™ is offered in a kit format composed of basal medium and associated supplements and growth factors called “LifeFactors®”. This kit allows you to prepare fresh medium in your laboratory, extending shelf life and enhancing performance. 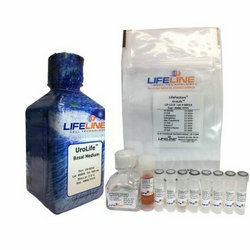 UroLife™ Basal Medium is provided in a light-protected 500 mL bottle. The remaining LifeFactors® are packaged in a convenient gas-impermeable pouch for easy storage. UroLife™ contains no antimicrobials and no phenol red, because they are not required for eukaryotic cell proliferation.